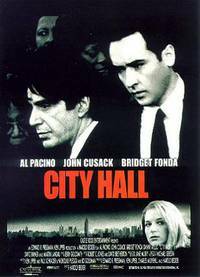 City Hall is a 1996 American suspense drama film directed by Harold Becker and starring Al Pacino, John Cusack, Bridget Fonda and Danny Aiello. The film was Becker's second collaboration with Pacino, having directed him in Sea of Love (1989). This webpage uses material from the Wikipedia article "City_Hall_%28film%29" and is licensed under the GNU Free Documentation License. Reality TV World is not responsible for any errors or omissions the Wikipedia article may contain.